I looked and did not find a topic specifically related to trading coins. Some other topics moved towards people posting trade info. I have made 2 trades by mail with other Cachers for coins and figure there should be a spot where others can list their wants, needs and offers. Have several California coins, new, unregistered, never in the wild. Have one Washington State coin, also unregistered. Email me with your offer or post here. I'd trade you a west tennessee geocoin for a california one, but sadly I'd feel like I'd be cheating a bit, as you can still purchase tennessee ones (I think). Looking for any other unregistered, in baggies (read: bright, shiny and new!). anyone interested in a used Canadian Geocoin? I also have extra Canada coins that are also new. I'd like to trade for any other coins that are out there. I have extra Alabama, Washington state, and West Tennessee coins to trade. They are all new and unactivated. I would be interested to trade for anything not listed below. I have made 2 trades since I posted 2 days ago and the coins are in the mail. I still have a couple of California coins to trade. Looking for others that are unregistered/unactivated. I've set up a trade for a Pennsylvania coin! I still have new and unactivated Alabama, Washington and West Tennessee coins to trade for anything that I don't already have. Must be a 2004 USA Geocoin in your collection as the 2005 USA Geocoins haven't been released yet. Is there a resource of all the places selling Geo-coins? It would be nice to buy the "base" coins that are in production and then hunt those that are not. If anyone wants Canada coins, they can still be purchased. Thanks! I really appreciate the link. Oops! I'll just leave it...I'll order one anyway. Where do I get a Pennsylvania GeoCoin? Or does anyone have one for sale? Thanks! I have 5 West Tennessee coins for trade. I'm especially interested in getting 2 Washington State coins. I'll also buy or trade for any coin #357. Send me a PM or email. I got the Washington coins I was looking for. I am still willing to buy or trade for any coin #357. I have extra AGA coins, West TN coins, a Conejo cachers coin, Michigan, and a few others for trade. Any others I do not have! Always interested in trades for my MRCOGEO GeoTokens. I love trading for GeoCoins, wooden nickels and homemade GeoTokens. So if its round, square, slightly round or a polygon and fits in the palm of your hand and has your Geo-Sig alias on it, I'd love to trade for it. I'd like to puchase a 2004 PA Geocoin if anyone has one that they'd sell and accepts PayPal. Email me. got two offers in 12 hours last month in the northeast forum for a trade for a WA one, piece of cake ! Looking for California, Texas, Idaho coins. Can trade Washington now, Colorado/Calgary after they ship (date unknown), and WestTn (after they arrive in a couple/few days). Reasonable $$$ also fine. I would really like a new KY coin if anyone has one to trade. I have a Calif, Canada, Washington, Texas, or Tenn coin to trade. Also keep your eyes out for Oregon coin version 2. We will probably be redesigning them for the spring 2005 run. Will you post a thread about them in the NW forums, or will you only advertise them on the Oregon or PDX sites? Idaho coins are still a couple weeks from delivery. I'll have a few for trade when they get here. I am interested in having a couple unactivated 2004 USA Geocoins. Unfortunately, I have nothing to trade except our signature wooden nickels, but I would be willing to pay something reasonable. If anyone can part with one or two or if you know of a source I can use, please email me. I have unregistered California geocoins that I'd be interested in trading for geocoins that I do not currently have. If you'd like to trade, you can reply here but it probably makes more sense in this case to just email me directly via the site. The coins I have are: 2003 USA, 2004 USA, Canada, ckayaks, vacman, GOWT, Oregon, Washington, Conejo, and Waypoint 15. All I want are some older coins. Waypoint 1, and DHOBBY1. I am interested in having a couple unactivated 2003 USA Geocoinsfor my kids. I have nothing to trade as far as coins go but contact me and I will do my best to work something out. I think it would be great to have a coin from the year goecaching started for us. 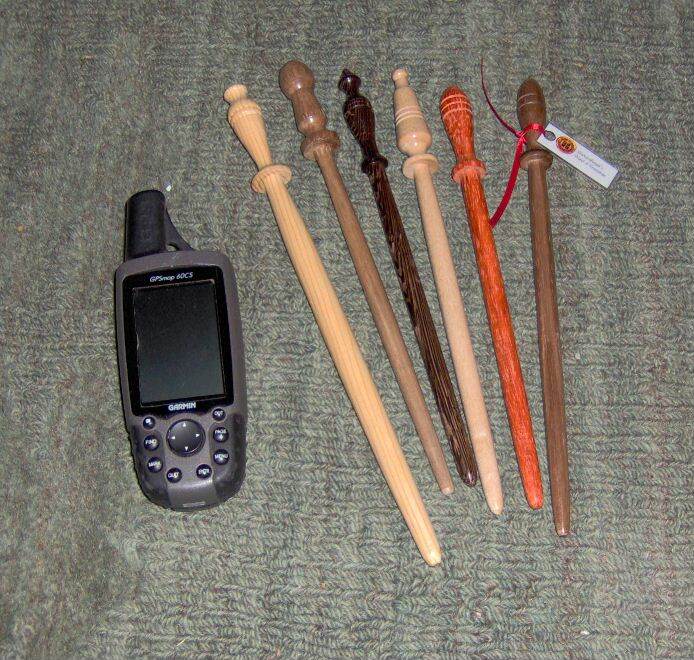 The wand on the right is currently in the hands of Joefrog! Love it!! NurseDave showed me his collection. He probably has the largest collection of trade items there is!! Hes' got photos by category; coins, cards, buttons, signature items. I'm very impressed with it. I could have sworn I sent him a signature item. I'll have to do that. Might make a good article in Today's Cacher. Show some of the larger collections, maybe provide the links as a sort of guide to what's out there. I use Dave's and Fisur's sites as a reference. AAaaaaa!!! That would just mean more competition! So my question is: Is the trafficking of ill-gotten blackmarket geocoins something I should have to learn to accept from you guys? Thanks for painting blame with a broad brush, and for doing it with a bogus account to boot. I would say that it shouldn't surprise you, regardless of how many finds someone has. I recently had a traveling USA geocoin reported missing by the last people that had it. I have no way of knowing if they decided to keep it or really lost it, but in any case it didn't surprise me. Same goes for the yellow jeep travel bugs and other potentially collectible and/or valuable items. Trade items and regular TBs get swiped regularly, so it's no shock that geocoins do as well. If something is meant to keep moving, I won't keep it, but there are a *lot* of people that play by their own rules and morals. Sorry that it sounds like your coin got swiped. I say you should have someone local to the person in question take a peek at their collection and see if your coin is in it, and if so go public with their name as someone who stole your coin and then lied to you about losing it. If anyone is interested in selling unregistered geo-coins, feel free to e-mail me with offers. Off topic posters need not reply. I'm a guy are you talking to me? I paid for most of my coins and swapped for others. Got a big box full of them waiting for the future. It isn't fair, but I have said in the forums before that realistically (human nature being what it is) I wouldn't expect a coin to move very far. TBs are for traveling and coins are better viewed as cool trade items. It's a shame that not everyone can play fair. Most people post either "keep this coin moving" or "feel free to keep it". If it doesn't directly say you should keep a coin it should keep moving. The saddest things is Geocoins and Jeep Travel Bugs are like two dollar bills. For some reason people think that $2 bill and geocoins are actually worth more than what they are actually worth. If Geocoins were actually "worth" collecting for besides the 'neato' or 'cool' factor they would be selling all over E-bay for crazy prices. OK, so back on topic I have an update on my original post. I am interested in trading for coins I do not already have. The coins I have are: 2003 USA, 2004 USA, Canada, ckayaks, vacman, GOWT, Oregon, Washington, Conejo, Waypoint 15, Green Man, and Joy of Geocaching. Coins I have available for trade are: California, Conejo, Washington, GOWT, ckayaks, vacman. I have a nice new North Carolina coin to trade for a Kentucky or Michigan. Any clubs out there currently producing or selling geocoins other than the calgary and west tenessee coins? Texas has a 2003 coin and are currently in the process of making a new coin.